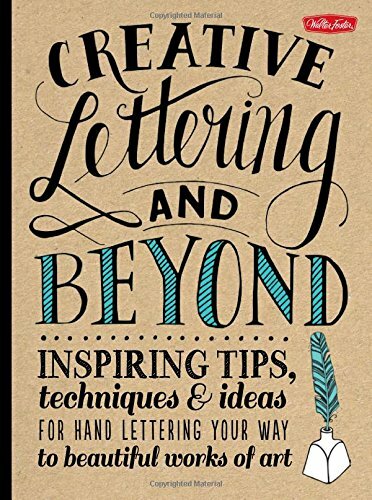 Creative Lettering and Beyond is a casual workbook on creative lettering and handwriting. It's more about the fun rather than going for the classic look from traditional pointed pen calligraphy such as Spencerian or Copperplate. However, it does borrow inspiration from those calligraphy styles and others as well. This is a huge paperback with rounded corners. There are 144 pages of tutorials and instructions taught by four instructors, namely Gabri Kirkendall, Laura Lavender, Julie Manwaring and Shauna Lynn Panczyszyn, all of whom creates calligraphy art. The fonts for the text in this book are huge. The instructions are easy to follow and you don't really need too much tools to start. Just a pen with a flex nib will do, and ink of course. The instruction style is that of showing you some examples, and then you just copy what you see. There are little helpful arrows that show you which directions to move your strokes so you won't get lost. Some blank pages are included for you to practice inside the book. The first half of the book focuses on the more traditional methods of applying ink on paper. The latter chapters are more adventurous and goes on to use watercolour, chalk, turning your handwritten letters into typography using computer, lettering with porcelain pens, decorating your personal crafts. It's a fun book on creative lettering that anyone can get into. If you want more examples on creative lettering, check out Creative Lettering: Techniques & Tips from Top Artists and The Art of Whimsical Lettering.